Mixe of Oaxaca - Mexican Textiles , backstrap woven huipils, embroidered blouses and video.the traditional dress is very diversified and some of the most unique in the Mexico. Info from the Summer Institute of Linguistic Study, include comments about the culture. Info en Espanol de districtos Mixes - formato PDF. 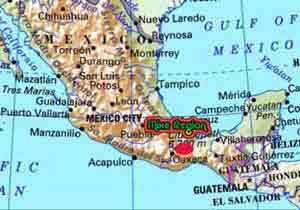 For information in Spanish about the District of Tlahuitoltepec PDF. About the galleries- We have visited the Mixe region at least three times in the last 5 years. The Mixe are a very proud people who were never conquered. There crafts are a great mix of backstrap woven garments, hand embroidered textiles and machine embroidered blouses. In each of the village pictures here the textiles are in varying state of change. Long cotton skirts and peasant style blouses are common even in towns were the women still wear huipils. Some Mixe village not pictured here have lost there textile tradition completely. In many village crafts are used in the traditional manner, such as clay cooking pots and woven palm mats and of course textiles. The Mixe, who number about 85000 people, live in the North East corner of the state of Oaxaca, which borders the State of Vera Cruz. There are three distinct areas, the highlands above 5500 feet, the mid lands 2400 to 5500 feet and the lowlands. The highland area is mountainous with many spectacular views; the middle area has a great deal of forested land. The highland has a sacred mountain called Zempaltepelt, which is said to be the home of Condoy the Mixe leader. The Mixe believe they are from Peru. Another interesting fact about the Mixe is that the Zapotec, Aztecs nor the Spanish ever militarily conquered them. Agriculture is the main economic activity with the traditional corn, beans and squash and potatoes the most common crops, common farm animals are an important source of protein as well. Coffee and sugar cane grow in the lowland and mid ranges. There is a large Mixe community on migrants in Los Angeles, California. The Mixe are Roman Catholic with strong pre Columbian ties to the non-European belief system. The pantheon of spirits that controls many aspects of their lives. These spirits affect the Mixes in different ways, many of the celebrations and festivals are to worship these spirits and ask for assistance. Linguistic family - mixe-zoque which includes the Mixe (ayuuk), the Zoque and the Popoluca; there are those that also include the Tapachulteca (an extinct language).There is comment in some reference material to a link with the languages spoke in Peru.